A new baby’s arrival impacts a family, told from the point of view of a delightfully unreliable narrator — a wildly imaginative 7-year-old named Tim. The most unusual Boss Baby (Alec Baldwin) arrives at Tim’s home in a taxi, wearing a suit and carrying a briefcase. The instant sibling rivalry must soon be put aside when Tim discovers that Boss Baby is actually a spy on a secret mission, and only he can help thwart a dastardly plot that involves an epic battle between puppies and babies. KIDS FIRST! Film Critic Tristan T. comments, “The Boss Baby is fabulously directed by Tom McGrath, who you might recognize from his work on all three Madagascar movies and Megamind. He says that the movie is partially an apology letter to his own brother for all the grief he put him in when they were young.” Mia A. adds, “This film is very funny because Tim and the baby are always fighting. Sometimes they put scenes in slow motion which makes them extra funny. In one scene, the babies are going against Tim and everything is over exaggerated. I went with a 6-year-old and she and the rest of the audience laughed a lot.” See their full reviews below. Dreamworks’ The Boss Baby, is an extraordinary, fun and lighthearted animated film based on an award-winning picture book by Marla Frazee. 7-year-old Tim (Miles Christopher Bakshi) had the perfect life and the full attention of his parents until one day, a new arrival took it all away and became the Boss of his family. Tim and Boss Baby face sibling rivalry, trying to both win the affection of their parents. Much to Tim’s surprise, the two bond when they join forces to uncover the evil plot of the CEO of Puppy Co. And in the midst of it all, Tim and his new brother Boss Baby (Alec Baldwin) learn the true meaning of the love of family. The Boss Baby is fabulously directed by Tom McGrath, who you might recognize from his work on all three Madagascar movies and Megamind. He says that the movie is partially an apology letter to his own brother for all the grief he put him in when they were young. 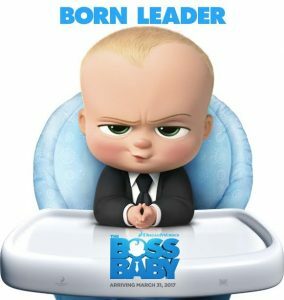 My favorite character is Boss Baby. Alec Baldwin voices this character with great panache. His witty personality mixed with a take-charge attitude bursts through the screen. I feel that Baldwin’s voice talent in this is one of the key reasons this movie shines. My favorite scene is when Tim and Boss Baby work together to sneak into Puppy Co. and attempt to steal the secret file. Watching a working large scale replica of one of my favorite games when I was young (Mouse Trap) was particularly fun. Also, there are many toys from the 70s and 80s included which I enjoyed. Several times I found myself times trying to find them in the scene. There are so many magical moments throughout. As an only child, it’s funny that there are times the movie made me want to have a brother and, other times, I’m happy to be an only child. The Boss Baby is an enjoyable film, safe to keep you and your family thoroughly entertained. Director Tom McGrath states “I want this movie to draw you in and make you move to the edge of your seat, not pull away from the screen” and I believe he achieved that goal. It is rated PG for mild humor and I recommend it for ages 6 to 14, although the whole family will enjoy it. I give this film 4.5 out of 5 stars. It opens in theaters nationwide on March 31, 2017 so, go check it out. The Boss Baby is a hilarious movie about a boy named Tim (Miles Christopher Bakshi) who has a pretty great life with his parents, until one day he gets a baby brother (Alec Baldwin) who wears a suit and tie. Tim is very skeptical about this new baby brother, but eventually he works with his baby brother to help stop the antagonist, the CEO of Puppy Co. This film is very funny because Tim and the baby are always fighting. Sometimes they put scenes in slow motion which makes them extra funny. In one scene, the babies are going against Tim and everything is over exaggerated. I went with a 6-year-old and she and the rest of the audience laughed a lot. The animation in this movie is very detailed and brightly colored. The creative use of so many colors help give each scene a happy feeling. There is a lot of detail in this movie such as the characters’ hair. You can see little strands of hair and each individual eyelash. Having so much detail on each character helps make it more realistic. The moral to this film is “don’t judge a book by its cover.” Although Tim is right to be skeptical about the new baby, he doesn’t get to know the baby before judging him and jumps to the conclusion that he is bad. My favorite scene is when Tim tries to show the parents that the baby can talk. This is a very funny scene because everything is so over-the-top and the slow motion parts are hysterical. The music is primarily one song, Black Bird. This song is sung throughout and is Tim’s favorite song. Black Bird brings a sweet mood to the film whenever it is sung. I recommend this film for ages 4 to 14 because. It is a pretty funny movie parents can take their kids to, but you should know that there is a reference to killing people which might be scary to little kids. I rate this movie 5 out of 5 stars, because the plot is really developed and it is very funny. Go see The Boss Baby in theatres when it opens March 31, 2017. I think you will love it!